In the distant past before Cape Town was discovered and built up by man many animals roamed the plains. Today however all these plains have been stolen from the animals and turned into towns and villages. The animals that roamed the plains have been pushed further and further from their natural habitats and many of them have become extinct. Lions that once roamed the Cape Flats were shot and killed by hunters over the years . The few that are left are now only found in zoos and Nature Reserves. Today all Cape Town has left are a couple of smaller wild cats. The largest of these is the leopard and it is one of the few cats that still roam the mountain ranges around Cape Town. The leopard although large is not dangerous until it is cornered and then will attack only to protect itself. In the mountain ranges to the north of Cape Town wild leopards are still found. Unfortunately there is a dispute between them and stock farmers as farms sometimes extend into the natural habitat of the leopard or farmers graze their livstock high up on mountain ranges. Of course a sheep or goat is easy prey for a leopard and if it is hungry it will attack and eat them. This upsets the farmers who take revenge by shooting the leopard. When Van Riebeeck arrived in Cape Town in 1652 the leopard was found throughout South Africa and the main concentration areas were the Karoo and up into the Eastern Cape. Leopards were constantly hunted and were exterminated from the Karoo regions by the end of the 1900s. During the period from 1947 to 1955 laws forced farmers to kill the leopard as it was classified as vermin. This law had the effect of drastically reducing numbers. A bounty was placed on the leopard and 821 ”bounties” were paid out for leopards that were killed. This substantially reduced the numbers in the Northern and Eastern Cape. Today leopards are mainly found in the mountains of the Southern and South Western Cape, the lower Orange River area and the Kalahari Gemsbok National park. As numbers are so low there is now an effort being made to conserve them. Many leopards have been caught and radio collars placed around their necks so that the conservationists are able to track them. 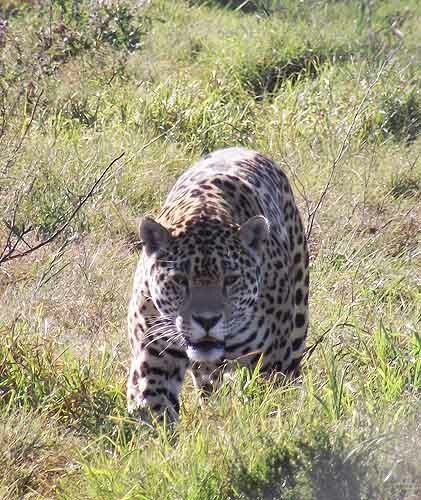 It has been discovered that in the mountains above Stellenbosch the home range of a male leopard is 338 square kilometres whereas that of a female is 487 square kilometres. The size of the home range suggests that the population must be very low. In the Cedarberg the home ranges of leopards tracked ranges from 44 square kilometres for an old male to 69 square kilometres for an adult male. It is interesting to note the patterns of the leopards as they mark out their territories. They move rapidly backwards and forwards across their ranges and demarcate their territories with droppings and urine. Leopards normally stay high up in the mountains and don't come down to feed even in the winter months. Where they come into contact with livestock it is normally the farmer extending his territory or grazing his stock in an established leopard teritory. Leopards are opportunists and will feed on any prey that presents itself. Their normal prey is dassies (Rock Rabbits) and small antelopes although rats mice and other small animals form part of their diet. In the Wemmershoek area where there are feral pigs researchers have found evidence that leopards have caught and eaten them as well. Baboons which are quite plentiful in the mountains are also prey to the leopard. They however take to the cliff faces when leopards are about. It is thought that the mere presence of a leopard in a specific area will control the baboons and assist farmers who lose crops to them when they raid the fields. Conserving the leopard is of paramount importance. Without them problems could be experienced with rock rabbits rats and mice which are all part of the food chain. To do this is quite difficult as many of the home ranges of leopards cross farm lands. It is therefore necessary to include the farmers in the conservation plan. Certain restrictions have been placed on farmers with regards to hunting the leopards. Anybody hunting a leopard must have a permit. To get the permit he must request that personnel from the Chief Directorate of Nature Conservation visit the area to establish that it is in fact a leopard that is attacking his livestock. The permit once issued expires after 3 months although it is sometimes issued for shorter periods. If a leopard is shot and killed it remains the property of The Department of Nature Conservation. If the farmer would like to keep the skin of the leopard he has killed he has a month to apply to Nature Conservation to keep it. When permission is granted further restrictions with regard to the skins apply. They become non transferable and may not even be donated or sold. Of course if this was allowed there would be wholesale slaughter of leopards for their skins. Help us keep our natural heritage by supporting nature conservation in South Africa.